No doubt there’s a coffee-fanatic you still need to buy a gift for this year. But what are the best gifts for coffee drinkers this xmas? Here at The Coffee Bazaar we have got you covered and spared you hours of research and shopping around. This is our definitive list of the hottest coffee gifts for Christmas 2018 under £25. We think you’ll find something here that’s just are perfect for a memorable secret Santa gift, stocking filler or token of affection for your coffee quaffing friends and family. 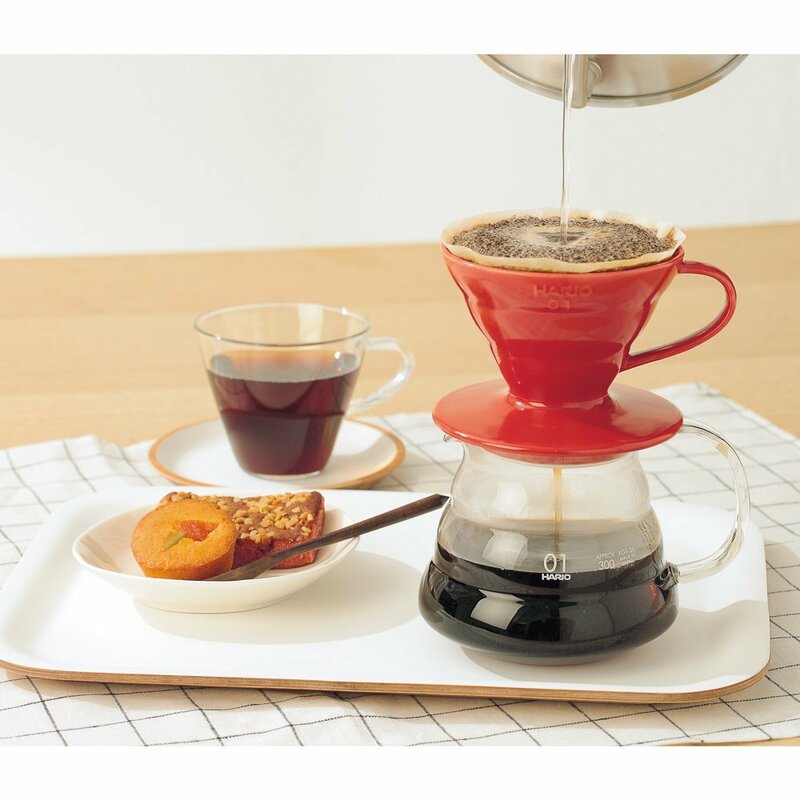 This lesser-known bit of coffee making kit is seriously big in Japan and is the favoured brew-method of locals who quaff 3.3kg of beans per capita a year. It looks very quirky and is also scientifically designed to produce great coffee. The system’s cone has a 60-degree angle and spiral shaped ridges inside the spout to maximise the expansion of the coffee and enable air to escape while brewing. Although The filter papers for the V60 will need to be ordered separately, they are cheaper than others on the market. This basic kit comes included with a measuring spoon to help you get the right ratio of grounds to water. It’s a pretty simple gift, but any coffee fan will appreciate a good quality packet of beans. 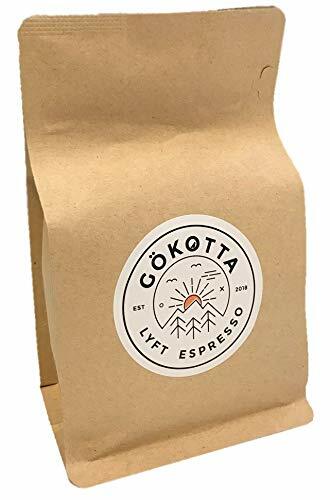 This Lyft Espresso from artisanal coffee makers Gökotta Coffee has been our favourite coffee this year (you can check out the full list in our best arabica beans post here). The beans are sourced from hillsides in Colombia’s coffee-belt and it is a great all round coffee, faring well when used to make coffee using a variety of different methods. It’s available whole bean or ground and comes in two different sizes – both under £25. ‘Tis the season, and a cup of joe goes down real easy after endless helpings of mince pies, turkey and Christmas pud. 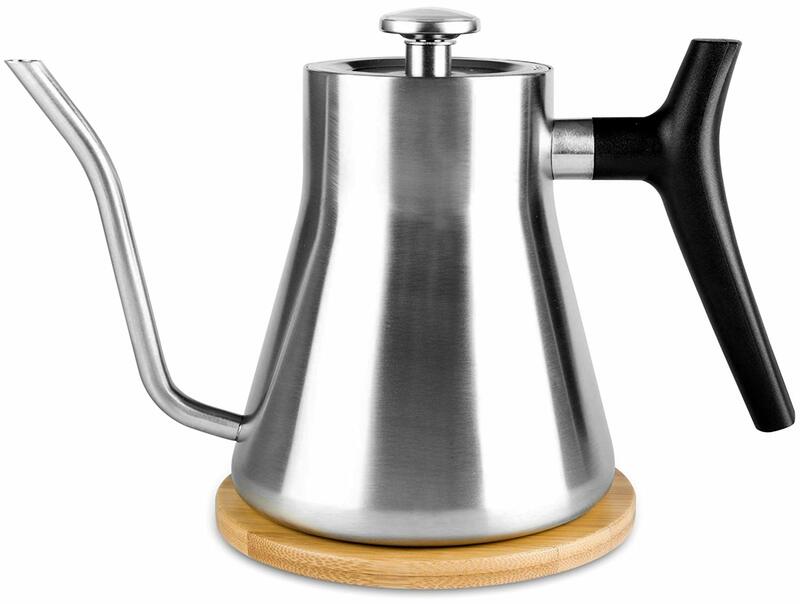 Here’s a great kettle for coffee fans. Not only does it look elegant – it will also help you make better coffee than than most standard kitchen appliances. The goose neck kettle comes with a slender spout to maintain even water flow which makes it perfect for making drip-filter coffees, helping to achieve a balanced and well-rounded flavour. The unit also comes with a built-in thermometer so you can heat your water to the desired 92-94 degrees temperature range that is ideal for getting the most out of your beans. It is a small enough 1.2-litre affair, so is energy efficient and comes with an comfortable easy-grip handle and stylish looking heatproof mat to protect your kitchen counter top or living room table. Everyone loves a flat white, cortado or morning cappuccino. Sadly most coffee consumers simply don’t have the wallet for the kind of professional steaming wands needed to make decent frothy milk. There is another way! This attractive looking machine lets you froth warm milk manually using a bit of old-fashioned elbow grease. 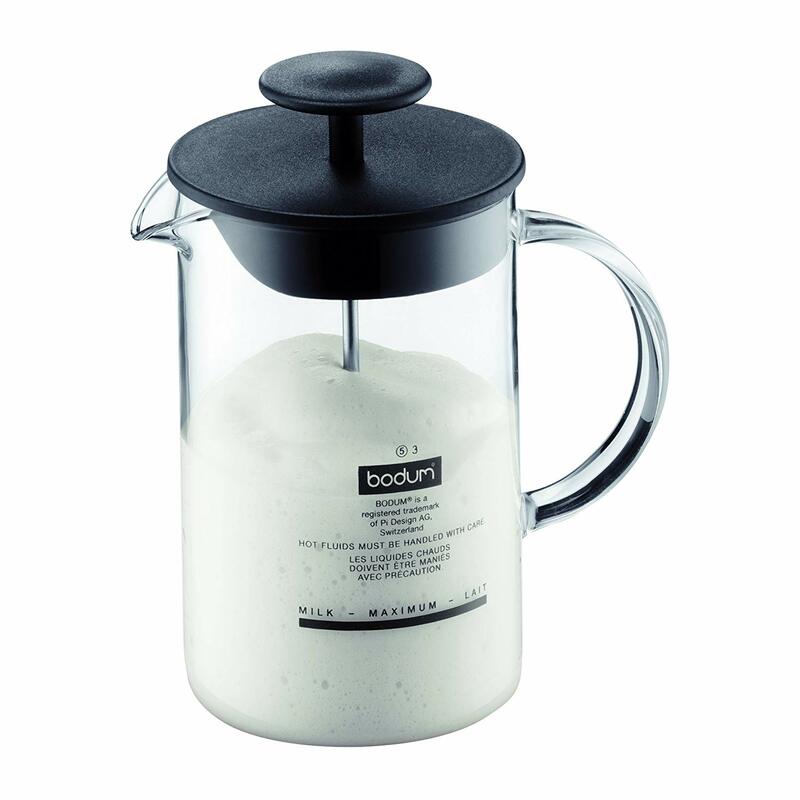 The plunger-like design is very effective and creates silken frothy milk with plenty of small and foamy bubbles in it. It’s a much better bet that cheap handheld battery powered wands and made from hardy borosilicate glass that will last a lifetime. It’s dishwasher safe for easy cleaning too – a winner. Everyone should have a reusable coffee cup. Disposable cups and lids are adding to the plastic crisis our oceans are facing while also being a substandard container for takeout coffees. This edition from KeepCup is one of our favourites on the market. 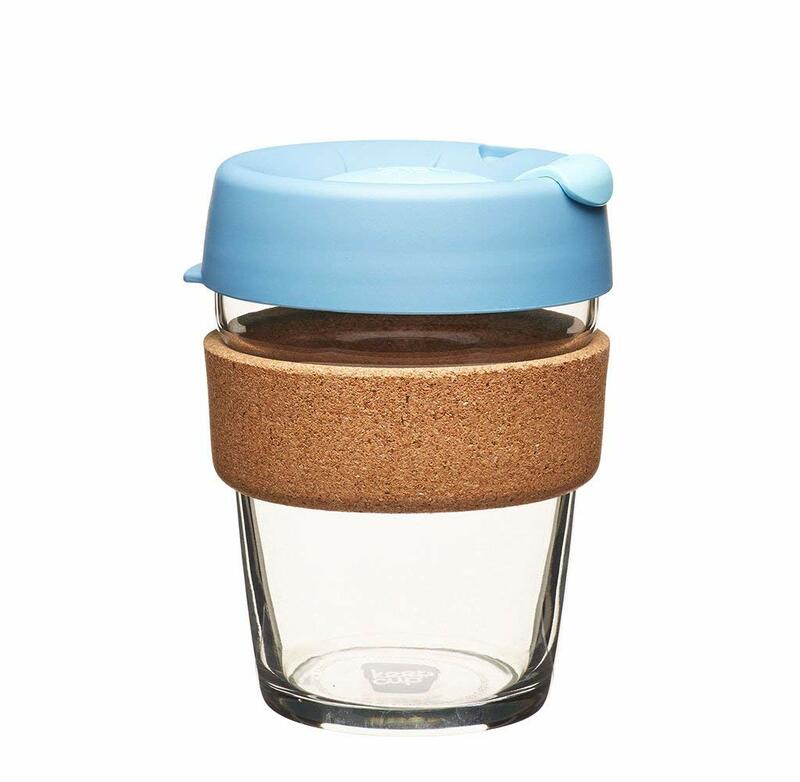 It’s made from recyclable BPA-free glass and has a polypropylene lid that prevents spillage and helps keep your coffee warm. The cork gripper makes it super comfy to hold and looks fantastic. The cup fits into a standard car beverage holder and is microwave-safe in case you want to reheat your coffee later. There are plenty of colour options available for the lids. Remember that most vendors offer a 10% discount for people bringing in reusable cups, so this really is a gift that just keeps giving! This is much more than just a coffee table book! 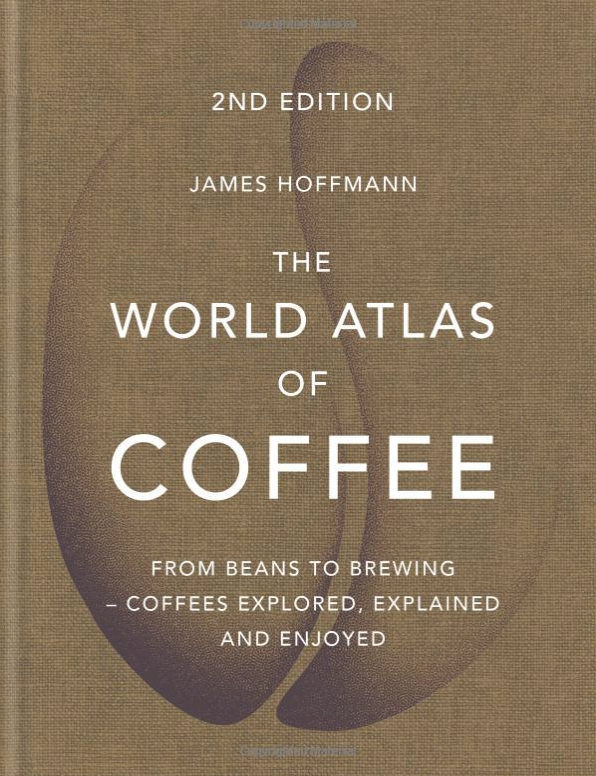 The World Atlas of Coffee is a perfect gift for the bean buffs in your life. It is a beautifully put together compendium that provides detailed scientific, historical and geographical knowledge that will ensure you will never look at a steaming hot brew the same way again. The book contains helpful and detailed brewing guides, a host of info on bean types and varieties as well as a run down of the main features of coffee grown in all the world’s major producing regions. Next Post: Which is the Best Decaffeinated Coffee?